I hope all is well in your tinkering world. Things, I imagine, are at least beginning to thaw out from winter, and you’re making your plans to start installation of new parts, tweak old ones and get your wheels back on the road in time for summer. Normally, my letters are filled with advice on who to avoid, who annoys the crap out of me, and basically the type of people I encounter in the car world, including you, Car Guy. This time though, I have some news, and it’s pretty fantastic in my opinion, but first I want to tell you about some things you might already know. I’ve recently been thrown into a world. A world, I don’t know very well, hardly understand, and at times really question the reality of. This world is full of love/hate relationships, long distance friendships, camaraderie, and most of all SUPPORT. A place where any and all questions can be answered with simple use of the search tool (newbs take note: NOT in the shout box). Where groans and thanks are given for any and all ideas or comments. Where wives, girlfriends, and random girls from the internet are shown in all their glory, much to the amusement of those doing the viewing. Where the guys go to hang out, chat, avoid work, find entertainment, make plans for an install, swap stories of triumph and failure, and all around give one another a hard time (all in good fun of course… sometimes). 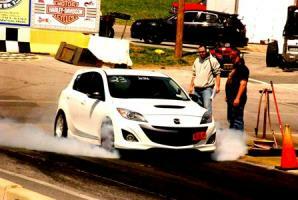 As a platform Mazda is not huge, but what it lacks in size, it makes up for in community. I have seen the Mazda community do some amazing things, support their friends in need, gift parts to those that are deserving, protect respected Vendors, stand up for what is right, and overall form itself into an online community of what I would deem as (mostly) “Good People”. Forums connect Car Guy to Car Guy. Car Guys to the very few Car Girls, and of course vendors to Car Guys. It’s one big exchange of information, ideas, innovation, and experiences. We’re able to come together for the sake of bettering the Mazda Enthusiast Platform, and to be honest I FIND IT AMAZING. Now, mind you, this isn’t exclusively on the internet, and that’s where my news comes in to play. There are gatherings: Cars and Coffee, Nator Meets, and Dyno days at local Vendors. Coming up really soon, is an amazing gathering, one of grand proportions, in just a few short weeks: THE EPIC NATOR MEAT, or ENM as it’s so lovingly referred to. Car guys gather for an awesome Dyno day, opportunity for Track time, dinner for a social gathering, and a parking lot FULL of Mazdas to show off and compare. It’s looked forward to by many in our platform every year, and especially for those here at CorkSport for a chance to get out of town for a bit and connect with everyone. I write this to you, Car guy, excited as all get out, because CorkSport will be there! Prepared to answer any questions you have, place orders on the spot, get input and any product ideas you want to see happen. Mostly though, to make a connection with the amazing customers we serve, and to enjoy the time spent with fellow enthusiasts. Typically, I’d just be excited to hear about it from the guys later. Hear them brag about how great it was, how well it went, and all the people they met. Except for the fact that, I’m the type of girl who likes to experience things first hand. So, I’ll be seeing you there! MSF : EPIC EAST COAST NATOR MEET from Paul Schmitz on Vimeo. Still a great post , I just had to get that out about C&C ( I’m a little PO at them). Very eloquent Kim, so much truth in those paragraphs above! Oh, just be ready for many hugs from car guys and car girls!